A mechanism allowing the intensity of radiation emitted in the blue-violet spectral interval by gas-discharge plasma created in the mixtures of mercury diiodide vapor, xenon, and neon to be increased in comparison with the intensity of radiation from gas-discharge plasma in the mixtures of mercury diiodide vapor and neon is established. The plasma parameters and the reduced electric field, at which the specific discharge power spent for the excitation of mercury monoiodide exciplex molecules is maximum, are determined. The research results can be used for the creation of a more efficient exciplex lamp with bands emitted in the blue-violet spectral interval. R. Burnham. Discharge pumped mercuric halide dissociation lasers. Appl. Phys. Lett. 33, 152 (1978). Yu.E. Gavrilova, V.S. Zrodnikov, A.D. Klenentov, A.S. Podsosonnyi. Excimer HgJ* laser excited by an electric discharge. Quant. Electron. 7, 2495 (1980). A.N. Konoplev, V.A. Kelman, V.S. Shevera. Investigation into pulse discharge emission in ZnI2, CdI2 and HgI2 mixtures with helium and neon. J. Appl. Spectrosc. 39, 315 (1983). A.N. Malinin. Excitation of mercury monohalides in the plasma of pulse-periodic discharge in mixtures of mercury dihalides and rare gases. Laser Phys. 7, 1032 (1997). A.N. Malinin, A.V. Polyak, N.N. Guivan, N.G. Zubrilin, L.L. Shimon. Coaxial HgI-excilamps. Quant. Electron. 32, 155 (2002). A. Malinina. 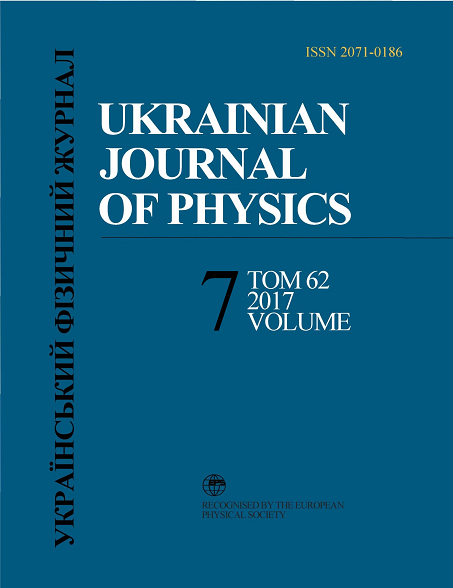 Diagnostics of optical characteristics and parameters of gas-discharge plasma based on mercury diiodide and helium mixture. Open J. Appl. Sci. 5, 826 (2015). A.A. Malinina, A.N. Malinin. Optical characteristics of a gas discharge plasma based on a mixture of mercury diiodide vapor, nitrogen, and helium. J. Appl. Spectrosc. 83, 592 (2016). G. Zissis, S. Kitsinelis. State of art on the science and technology of electrical light sources: From the past to the future. J. Phys. D 42, 173001 (2009). U. Kogelschatz. Ultraviolet excimer radiation from nonequilibrium gas discharges and its application in photophysics, photochemistry and photobiology. J. Opt. Technol. 79, 484 (2012). A.M. Boichenko, M.I. Lomaev, A.N. Panchenko et al. Ultraviolet and Vacuum-Ultraviolet Excilamps: Physics, Technology and Applications (STT, 2011) (in Russian). Yu.I. Posudin. Laser Photobiology (Vyshcha Shkola, 1989) (in Russian). V.D. Romanenko, Yu. G. Krot, L.A. Syrenko, V.D. Solomatina. Biotechnology of Hydrobionts Cultivation (Inst. of Hydrobiology of the NASU, 1999) (in Russian). E.A. Sosnin, P.A. Gol'tsova, V.A. Panarin, D.S. Pechenitsyn, V.S. Skakun, V.F. Tarasenko, Yu.V. Chudinova, I.A. Viktorova. Prospects of XeCl excilamp application in agriculture. Innovats. Selsk. Khoz. 3, No. 24, 7 (2017) (in Russian). A.A. Malinina, A.K. Shuaibov, A.N. Malinin. Optical emission of atmospheric-pressure dielectric barrier discharge plasma on mercury diiodide/rare gases mixtures. IOSR J. Appl. Phys. 9, 51 (2017). V.B. Basov. LEDs: advantages and disadvantages. Elektrozhurn. 6, 34 (2010) (in Russian). M. Sugii, K. Sasaki. Improved performance of the discharge pumped HgBr and HgCl lasers by adding SF6. Appl. Phys. Lett. 48, 1633 (1986). A.J. Berry, C. Whitehurst, T.A. King. Multihalide operation of mercury halide lasers. J. Phys. D 21, 39 (1988). M.M. Matthias, H.-J. Lewerenz, D. Lackner, F. Dimroth, Th. Hannappel. Efficient direct solar-to-hydrogen conversion by in situ interface transformation of a tandem structure. Nature Commun. 6, 8286 (2015). J.M. Hagelaar, L.C. Pitchford. Solving the Boltzmann equation to obtain electron transport coefficients and rate coefficients for fluid models. Plasma Sourcs Sci. Technol. 14, 722 (2005). BOLSIG+, Electron Boltzmann equation solver [http://www.bolsig.laplace.univ-tlse.fr/]. A.N. Malinin, A.K. Shuaibov, V.S. Shevera. Dissociative excitation of the B 2 Sigma (1/2)+ states of mercury monohalides by electron impact. Qvant. Electron. 10, 1495 (1983). V. Kushawaha, M.J. Mahmood. Electron impact dissociation of HgX2 (X=Cl, Br, I). J. Appl. Phys. 62, 2173 (1987). A.A. Malinina, A.N. Malinin. Experimental and theoretical characterization of dielectric barrier discharge in mercury diiodide vapor, xenon and helium gaseous mixture. Am. J. Opt. Photon4, 14 (2016). C. Roxlo, A. Mandl. Quenching kinetics for the HgBr* (2Σ1/2) and HgI* (2Σ1/2, 2Π1/2) states. J. Chem. Phys. 72, 541 (1980). S.P. Bazhulin, N.G. Basov, S.N. Bugrimov et al. Blueviolet HgI/HgI2 laser with wide-band optical pumping by a linearly stabilized surface discharge. Sov. J. Quant. Electron. 16, 663 (1986).